So did you like the Card Kit? I did! Well for this next installment of this article I wanted to focus on the patterned paper. I really enjoyed the versatility of the paper. It is double sided, which I am a huge fan of. I love that I could use it with my winter photos that weren't necessarily Christmas photos. 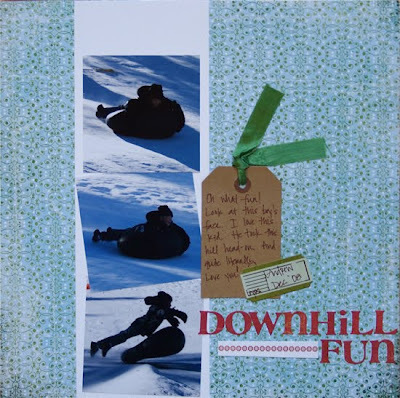 As you can see, these photos are winter sledding themed. I was easily able to incorporate them into the Eskimo Kisses line. This line is so easy to work with and will definitely give a wintery feel to your projects. *Tip: To make your layout a little 3D, just cut out some of the pattern and pop it up with foam tape or pop dots. So fun!! What do you think? Is this a line you would think about using for your layouts or more for your altered items and cards? Fantastic use of a beautiful line of papers. I always love the Basic Grey products, and I especially love anything for the Holidays and wintertime. 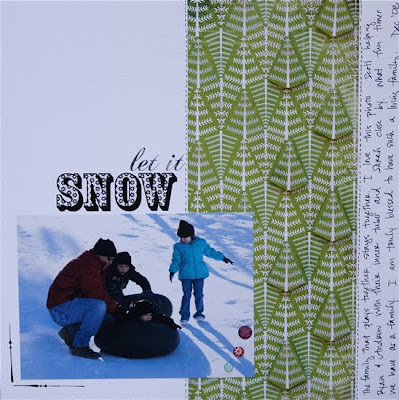 I tend to have a bit of difficulty using some of the tighter-patterned papers, and you gave me some great ideas here! I would absolutely use this line!!! And you're right, they could be used for WINTER themes too not just Christmas.....come to think of it, I have a lot of pp's that are very focussed on Christmas lo's and projects! Thanks for another awesome review!!! I how the design of the paper doesn't take away from the pics. Nice and soft patterns. Thanks. I adore this collection. I especially love the deer and winter house patterns. So adorable. I love this paper line. 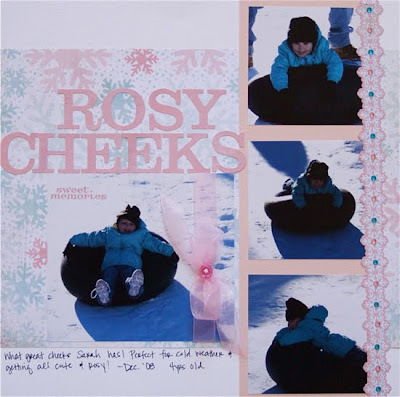 The snowflake paper in the "Rosey Cheeks" layout is my favorite!! 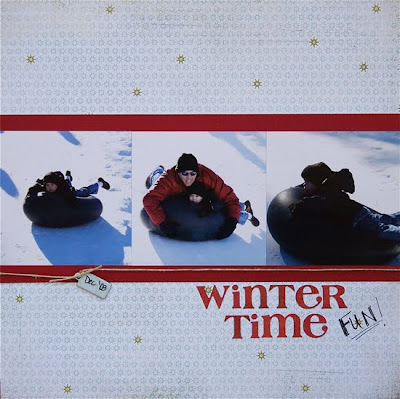 Iespecially like the winter theme as opposed to Christmas theme. It 8is much more versitle. Love it! Your layouts are so super cute. I would use this line for layouts, cards and alterables!!! The line is wonderful!!! I'm just loving the fun colors of this line. I would love to make a mini with this about all the snow we had last winter. The papers just feel right for that. I really like these papers. I was looking at all the other embellishments that match the line...love them, Great line! The layouts are all really pretty. It is so nice to have a paper pack for winter that isn't also Xmas! I can't wait to get some. I'm more likely to use them for cards since the prints are so small and they work so well for cards, and I already have such a huge stash of Christmas papers that saving Basic Grey for cards just makes sense! But that doesn't mean I never would use it for a layout, sometimes you have the right photo and you just have to have that paper! I love all Basic Grey for cards especially, but they're good for layouts, too. I love this paper, I've been using it myself! I haven't bought any of this line yet, but I think it is gorgeous and I'm hoping to order it soon. For me personally, I like the line for scrapbook pages. But my friend just used some of it on a christmas tree chipboard album that looked awesome. Thanks for the great reviews! Did I say yet how much I love this line? LOVE IT!! I think for me it would have to be for scrapbook layouts... gorgeous!! Love the 3D-tip! THANKS!